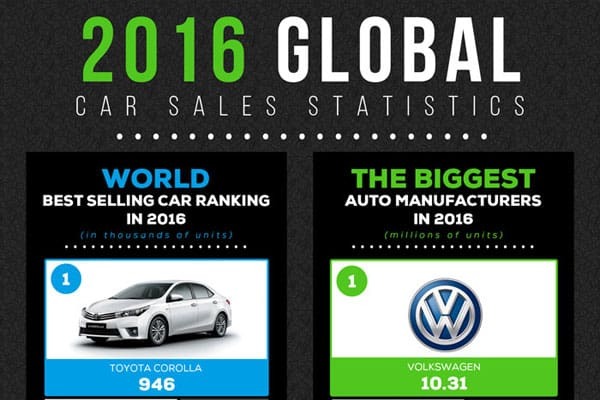 2016 was a good year for car manufacturers out there in the world. That’s because the number of cars that were being sold was increased by 6% when compared to previous year. Even though car sales were taking place at a slower pace during the first few months of 2016, it was accelerated during the last few months. The increased demand for cars in Western Europe and United States contributed towards the above mentioned fact. As mentioned earlier, the car sales boosted in United Stated by mid-2016, but it didn’t accelerate in neighboring countries such as Mexico and Canada. The attractive financing options that were made available for the people in United States seem to have created the momentum in car sales. With these financing options, people made the decision of replacing their aging vehicles with new ones. In fact, 17.55 million cars were purchased during the year for household use. When it comes to Canada, the prices of light trucks and new cars were increased during 2016. As a result, the purchase of new cars dropped by a significant amount. On the other hand, people in Mexico found it as a difficult task to purchase new vehicles with the increasing interest rates. The weak currency that exists within the country also contributed towards the drop in car sales. The number of car sales in Western European region was increased by 1.5%. In other words, 14 million cars were purchased by people in Western European region during 2016. It was a record breaking figure as well. The annual sales gains in this region measures about 6.5%, which almost doubles the global average value. Out of the sold cars, more than 20% were purchased by people in British market. The highest number of cars was being sold within China during 2016. It was over 28 million. However, this is a lower amount when compared to the statistics of 2015. Out of 76.86 million cars that were sold across the world, 17.55 million was acquired by United States. The other leading countries in terms of number of units sold include Germany, India, Brazil, Canada, Mexico and Russia respectively. When it comes to brands, Volkswagen is in top in terms of the number of cars sold. In other words, Volkswagen has sold 10.31 million cars during 2016. Toyota has acquired the second place with 10.21 million cars. Renault/Nissan, Hyundai/Kia and General Motors hold the third, fourth and fifth positions respectively. The bestselling car out of all is Toyota Corolla. Volkswagen Golf holds the second place in this index. The global car sale statistics are expected to show similar trends during 2017 as well. However, the sale of SUVs would accelerate significantly during 2017. If you want to get a better idea about it, you should take a look at the top rated SUVs of 2017. These vehicles are expected to revolutionize the vehicle sales in 2017 with their impressive and innovative features.